(BBC): Puerto Rico has introduced a new law protecting a swathe of the island's coast that has become a major nesting site for the world's largest turtle, the leatherback. The Northeast Ecological Corridor comprises 5.4 sq miles of the island's coast.The law ends a 15-year battle which pitted developers against green activists and several celebrities. Developers had been looking to build hotels, golf courses and luxury homes in the area, arguing that this would boost the local economy and create jobs. But the area – boasting lush vegetation and pristine beaches – is now likely to become a centre for eco-tourism. Last August thousands of leatherback eggs and hatchlings were crushed by bulldozers moving waterlogged sand from key nesting areas. (CNS): Two men who were arrested on suspicion of attempted murder in connection with the an incident on Thursday night, in which armed men fired on the police following a car chase, have been released on bail. Police are asking witnesses who may have seen the car (left) used by the gunmen parked in Camana Bay earlier on Thursday evening to come forward. Meanwhile, two further suspects, a 22-year-old man and a 29-year-old woman arrested on Friday on suspicion of conspiracy to defeat the course of justice have also been released on police bail. 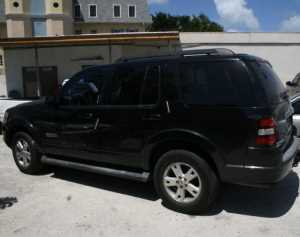 The black Ford Explorer 129 645, which was used in the shooting and recovered by police after the driver crashed the vehicle through a fence at the rear of Lakeside Condos, was parked in Camana Bay by the cinema from around 6:50pm on Thursday. The vehicle was removed about one hour later at around 7:50pm, when it was spotted and followed by a police unit at around 8:10pm along the Esterley Tibbetts Highway. Anyone who saw the vehicle at Camana Bay or elsewhere that evening between 6:50 and 8:10 is asked to contact George Town CID on 949-4222, the RCIPS Tip-line 949-7777 or Crime Stoppers 800-8477(TIPS). (CNS): The proposal by Dart to relocate the landfill to Bodden Town is looking increasingly less likely to become a reality anytime soon as it has failed to gain the support of the district candidates running for office in the 2013 general election. Even Mark Scotland, the former UDP government member and latterly a PNA candidate who had promoted the proposal as a viable solution to the country's waste-management problem, distanced himself from the idea at a Chamber of Commerce political forum last week. During the second debate in the district, Scotland said there was still no money to deal with the waste-management problem in George Town but the Dart idea was never anything more than a possible solution. Meanwhile, Osbourne Bodden, running with the PPM, and the two independent candidates, Vincent Frederick and Arnold Berry, who appeared on last Thursday's panel, all stated their opposition to the proposal, which was greeted with loud applause. There was no doubt that the small audience attending the Chamber forum in the district on Thursday was opposed to the relocation of the landfill to Bodden Town, and with few of the district candidates campaigning for office offering any support for a waste-management facility in the district, the local developer is losing what political support he had for the proposal. The islands' largest single investor had proposed, as part of the wider ForCayman Investment Alliance, a land swap with government that would see the current George Town dump closed and handed over to Dart, who would cap and remediate the existing giant pile of trash. In exchange, the developer had proposed giving government land it owns in Midland Acres, where it agreed to build a new lined landfill on a site large enough for government to eventually develop a modern waste-management park. The proposal met with widespread community objection from the start, and despite the recent publication of the Environmental Impact Assessment, the project is failing to attract the necessary political support it will need, with candidates recognizing the proposal as an election loser. Arnold Berry was the first of the candidates to speak on the issue and revealed his opposition to the plan. He said there was sufficient land at the George Town site to clean it up and manage the dump where it is. He said the situation could and had to be dealt with at the current location but because of a failure in leadership the problem had not been solved. Berry also pointed to numerous reports on how to tackle the issue, which he said were gathering dust on the shelves of government offices. Progressive candidates Wayne Panton and Al Suckoo, who appeared at the Chamber forum in the district earlier in the week, had already stated their and the wider party's opposition to the proposal and the aim of the PPM to deal with the dump at its current location. Osbourne Bodden, who is also running on the PPM ticket, echoed their sentiments. Bodden, who held a seat in the district between 2005-09 but lost that seat by a few dozen votes in 2009,pointed to the Central Tenders Committee's rejection of the Dart proposal during a legitimate request for proposals preocess, which was issued during the early part of the UDP administration. He said the awarding of a contract to a company which was then overturned as a result of the Dart proposal “spoke to corruption of the last administration”, Bodden added, as he accused the UDP of failing the country and the people when it failed to find a solution to the waste-management problem, despite the well-established cross party support for a waste-to-energy solution. Vincent Frederick, one of the original founders of the Coalition to Keep Bodden Town Dump Free, a local activist group formed to campaign against the proposal who is now running for office as an independent, said he had always opposed the proposal and still did. Acknowledging that the waste-management situation needed a solution, he said it could not be at the expense of the people of Bodden Town. He said the only dumping that would happen in the district was the dumping of the former UDP representatives. Although now running on the People's National Alliance ticket, a new group formed in the wake of the UDP split when the current interim government members joined forces with the opposition and ousted the premier from office, Mark Scotland had been a supporter of the proposal. However, in recent weeks, he has distanced himself from the idea. At a recent press briefing, his district running mate and interim Cabinet member Dwayne Seymour accused the former premier of throwing him and the other former UDP members under the bus on the BT landfill proposal and declared his opposition to the idea. Scotland has stopped short of declaring his total opposition to the project, but on Thursday evening he spoke about the plan as nothing more than a possible solution to an expensive problem. He said that the UDP government had proposed to do a study and consult with the people before any decisions were made. He said that the George Town landfill remained the country's main environmental problem, and with a price tag of some $100 million, the next administration would still struggle to find the money to deal with it on site. Scotland said the Dart proposal was a possible solution that the country could afford now. The environment minister said the issue had to be dealt with sooner rather than later and the next administration would be faced with the same financial difficulties that plagued the last government. This will place further development at Camana Bay in jeopardy as the Dart group has madeit clear that it is reluctant to build out the main residential phase of the community while the landfill is being mined or while it remains in its current state. The developer had tied the proposal to on-going development and agreed to begin the build out at Camana Bay once the dump issue was resolved. (CNS): A58-year-old woman turned up safe and well late last night, police said, after triggering a major search and rescue operation. A police spokesperson said the air and sea search lasted well over four hours but the woman had turned up at a Seven Mile Beach condo complex at around midnight when the police were eventually informed and the search called off. Police said the search started when the woman's husband contacted police at around 7:30pm on Sunday evening saying he had lost sight of his wife who was on a jet ski in the North Sound near Morgan's Harbour. At around 7pm police said that officers from the Joint Marine Unit had stopped and warned the couple who were riding separate jet-skis about speeding. Around 30 minutes later the man contacted police to say he had lost sight of his wife. A large scale search and rescue operation was immediately launched involving the Joint Marine and Air Operations Units. Several private boats also joined the search. Beach areas, docks, canals and the North Sound were all extensively searched but there was no sign of the missing woman, or her jet ski. Just before midnight police received a call to say that the woman was with a family member at a condo complex on Seven Mile Beach. The search was stood down shortly after when officers spoke to the woman and confirmed that she was safe. It is not clear at what point the woman had left the water or whether she had at any time been in any trouble. (CNS): At the Chamber of Commerce forum on Cayman Brac Friday night the only candidate to offer himself not just as a representative but as a cabinet minister was Moses Kirkconnell, who said that as tourism minister with responsibility for Cayman Airways he would make sure that the Brac had better air service. Premier Juliana O’Connor-Connolly, while emphasizing her experience as minister, was keen to refute claims by independent candidate Maxine Moore that she and Kirkconnell could not work together as MLAs. “We support each other, no matter what party we are in,” she said. First time candidate David Bodden, however, maintained that the current politicians were “not doing what is required” and that the party system was not working. People were hurting and they need “good change”, he said. While Moore, making her fifth run for a seat in the Legislative Assembly, thought that making flights more affordable was imperative, Bodden focused on the aircraft and the need to for a proper airport on Little Cayman. The Twin Otters (run by CAL’s inter-island service Cayman Airways Express) were not the right aircraft for the Brac, which needed a larger plane like a Dash 8 jet. However, Cayman Airways cannot operate three different aircraft and the Twin Otters were used because they can handle the limited landing strip on Little Cayman, which meant that the Brac “has to settle” because of this, he said. In a statement that echoed and appeared to endorse Kirkconnell’s desire for a ministry position, and with a backhanded criticism at her former party, the UDP, the premier said that more funds were needed for marketing the island but that would only happen if there was a minister of tourism who was from Cayman Brac. Cayman Airways, she said, should continue to be used “as a tool to get people to our shore”. All four candidates believed that the retirement age should be raised, but also wanted more young people employed on the Brac. Moore said the practice of retiring civil servants and hiring them back on contract should stop and those jobs should go to young people. 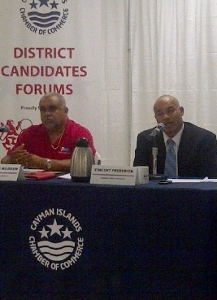 Bodden wanted to see another bank on Cayman Brac, and while he fully supported passing the national conservation law and fiscal restraint by government, said that he would “move very quickly to put a cruise ship dock in place”, so that small, medium or even large cruise ships could visit the island on a daily basis. This could be built for about $4 million, he claimed. Kirkconnell said that they should “look at small cruise ships and a dock” for the island, while O’Connor-Connolly noted that the UDP administration, of which she was a member, had “diligently pursued” getting a cruise dock for the island and had “got the Chinese to sign an MOU” towards building one. On the topic of job creation, the premier said that she had been talking to Dr Shetty (who is spearheading the creation of a health city on Grand Cayman) about establishing a medical school on Cayman Brac with about 200 students. She said she would “diligently work to pursue that venture”, which would not only introduce a “high level of academics” to the island but would also create employment as they would need to live and work here. Kirkconnell proposed encouraging back office work on Cayman Brac to create jobs and that government “should lead from the front” to make the Brac more self-reliant. He was offended, he said, whenever he heard that the Brac was a drain on the Cayman Islands economy. PNA candidate O’Connor-Connolly said that term limits on work permits, or rollover, was a “pet peeve’ of hers. “I never did support term limits,” she stated, and thought the “nationalistic approach” would “kill the goose that laid the golden egg”. Noting that Bermuda, Cayman’s competitor, had seen the wisdom of abolishing term limits, she said she hoped the next government would do the same. Both women on the platform were adamantly againstany form of legalized gambling, whereas the two men thought the issue should be put to referendum. However, Kirkconnell noted that he would not be in favour of making gambling legal only in the Sister Islands but it should be a national question. The two incumbents thought that the bill needed a couple more rounds of consultation but the premier said the law needed to be passed early in the next administration. Kirkconnell said that if the environment “gets ruined for the next generation, they will have nothing.” He also noted that it was important to pass the law from an economic standpoint so that potential investors could feel confident in their investment. Kirkconnell stood by his party’s position on one man, one vote in a two member constituency, with the candidates with the most votes gaining a seat in the LA, which was supported by the other three candidates, even the premier, whose former party, the UDP, had campaigned against it. On the topic of sports, O’Connor-Connolly made the surprising announcement that a sports instructor from Doha, Qatar, (where she visited for a postal conference in September last year) had been hired for the Brac to help the current sports instructor, Mitchum Sanford. She also said that she had “sat down with Dart” towards getting a 25m pool for the island. Both independents also wanted a better pool on the Brac, and Bodden thought the island should have a skate park for the young people as well. The PPM candidate indicated that he wanted to continue the plan for the sports complex on the Bluff that was started by the previous PPM administration – to put a running track round the field on the Bluff, to complete the changing rooms and encourage sports teams to visit and train on the island. The PPM and PNA incumbents thought that the number of police officers should be brought up to the right staffing levels. O’Connor-Connolly, who has been a cabinet member since the last elections, blamed the RCIPS for the shortfall. The government, she said, had always asked if they have enough funds and have given them what they wanted, but she had been told just a few months ago that the Brac station does not have a full complement of staff. Moore thought that tackling unemployment would stop the increase in crime but Bodden disagreed. “Bad people take advantage of a good economy as well as a bad one,” he said, adding that there was a need to “watch who we let into the country”. 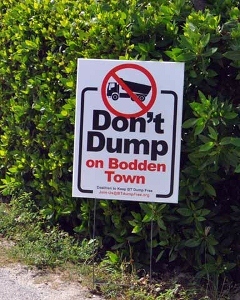 (CNS): The Coalition to Keep Bodden Town Dump Free said that it has refused to meet with Cardno Entrix, the company paid by Dart to undertake the environmental impact assessment in connection with the developer’s proposal to relocated Grand Cayman’s landfill to the district. Coalition leaders said they were not prepared to legitimize what they describe as a whitewash and that anything that needs to be said by the technical firm should be said publicly. The coalition members believe the study is not objective and independent as the evaluators were chosen and paid for by Dart. They also say that the people were never asked for their input on the need to relocate the George Town (GT) landfill, or on the choice of BT as the new site. Marleine Gagnon, another coalition spokesperson said the Environmental Advisory Board (EAB) was muzzled after suggesting that it also search for the best waste management solution for Grand Cayman. No government entity has ever decided that the GT dump had to be moved and no one knows who decided that BT was the best location, if indeed the dump had to be moved. “Dart’s dump proposal, nothing more than another landfill, is an environmental and social injustice,” Gagnon said. “Dart wants to needlessly dump the island’s waste problem on an environmentally sensitive area, where ordinary working people invested in homes with no prior knowledge of a waste management facility in their neighbourhood; rather than rectifying the waste problem where it is, in an industrial zone in GT close to the source of most of our trash." See details of invitation and the coalition’s refusal below. (CNS): Immigration officials said that a vessel with 15 male Cuban migrants all of which are believed to be first-time arrivals entered the waters off Cayman Brac on Friday night ( 12 April). Three of the man reportedly opted to disembark and end their treacherous journey and transported to Grand Cayman on Sunday morning, while the rest of the men departed around midnight on the vessel destined for Honduras without receiving any assistance. The men arrived just hours after four other Cuban refugees were sent back to the neighbouring island by the local authorities. The third repatriation of Cuban migrants for 2013 was carried out on Friday afternoon whenfour migrants were escorted home by the Department of Immigration’s Enforcement Section, following approval from the Cuban government. There are plans to return an additional 17 migrants over the next week, which will leave five of the most recent arrivals at the Immigration Detention Centre who are all awaiting processing. 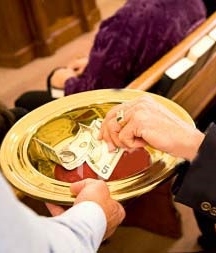 CNS): The public backlash over the donations that are still being given to churches via the Nation Building Fund continued to mount over the weekend, with hundreds of people commenting about the issue of the CNS website, most of whom were opposed to the way the grants are being distributed. With the decision regarding who receives grants and who does not appearing to be arbitrary and apparently in the hands of the former premier, the idea that this controversial fund is nothing more than a political slush fund has become a serious issue as Cayman counts down to the polls — but there has been no comment from the election authorities. Following the revelation on CNS that the now premier had announced to the congregation of the church she attends in Red Bay that it would be receiving $100,000 from the fund, post Nomination Day, the already controversial subject has raised some serious questions about its influence on the election. Nevertheless, the elections office, the police and the governor’s office have made no comment about the issue and its potential to unduly influence voters, despite the promises to clamp down on any form of election bribery, influence or vote buying. As controversy mounted and negative publicity about the grants grew, the Hillside Chapel in Cayman Brac became the first church to hand back its cash grant of $50,000. Meanwhile, in the light of the negative publicity, the Red Bay Church of God Holiness, which was at the centre of the latest storm, was also considering whether to hand back its cheque but there has as yet been no confirmation if it will give up the money it said it needs for roof and car park repairs. The Nation Building Fund was created by the former premier but it is also supported by the current interim administration. Established to help churches and other important local cultural establishments, as well as students who are unable to get scholarships through the normal channels, the fund has become exceptionally controversial as a result of large donations handed to churches, apparently without any 'value for money' test regarding the public purse. In addition, the grants seem to be arbitrary and, according to the current premier, the decisions have been made by former premier McKeeva Bush. Although a committee was supposedly established to examine applications to the fund, Premier Juliana O'Connor-Connolly made it clear on Thursday that the decision to give a grant from the fund and how much was at the discretion of the former premier. Although more than $4.5 million has been given to churches since 2010, when the money was first handed out, the reasons why one church gets hundreds of thousands and another just a few thousand dollars has not been explained. The former premier and the current premier, however, have both vigorously defended the fund and the grants to churches on the basis that they play a significant lead role in the community. The politicians also say it is cheaper for government to give the religious organisations money to repair churches so they can become hurricane shelters or set up after school programmes rather than run everything via the public sector. More than $10 million dollars has been given away so far and close to half of the donations from the fund have gone to churches. The next most significant chunk of public cash has been spent on specialist scholarships for students who did not meet the criteria to get one via the education ministry and for other forms of training or adult learning. The rest has gone to a mix of charities, NGOs and community organisations outside of the payments that government makes formally to community groups via purchase agreements in the annual budget. Although the audit office is understood to have examined the issue in its latest special reviews of government spending, the Office of the Auditor General has confirmed that it will not be releasing any further reports until after the election. The office must lay any document it produces with the Speaker of the Legislative Assembly before it can publish any of its work in the public domain. However, with the parliament now prorogued and no speaker in situ, the auditor general will not be releasing any reports until June. CNS is currently awaiting the release of the latest list of donations from the ministry but if it follows the follow timeline provided in the freedom of information law, the list may not be available until after the elections. (CNS): With just over five weeks to go before Cayman goes to the polls, there is still no sign of the value for money report which has been undertaken by PricewaterhouseCoopers in relation to the ForCayman Investment Alliance. The assessment undertaken by the local auditors was commissioned in accordance with the new requirements of the Public Management and Finance Law and is supposed to tell the public whether or not government’s agreement with the Dart group is a good deal for the public purse. However, although part of the deal has already been signed and sealed and a critical part of the West Bay Road gazetted, the deal remains under wraps. At each successive post-Cabinet press briefing held since the interim minority government took over the reins of power, the ministers have indicated that they expect to be able to release the document ‘shortly’, but target dates have come and gone. Although the ministers have now indicated that the document is due before the end of April, there is no new target date and, as a result, there are no guarantees that the electorate will get to see the critical document before the 22 May, General Election Day. Despite the importance of the FCIA to both the public purse and the wider economy, the NRA document, which was signed more one year and four months ago, has still not been made public. Although the earliest draft signed by the National Roads Authority, the former premier and the Dart Group was leaked into the public domain, that document has since been amended at least three times with major adjustments, but ithas not been released to the public. Speaking at Thursday’s press briefing last week, Environment Minister Mark Scotland said that the value for money report was still not ready to be released as it had not been completed, owing to the latest change, which includes Dart’s agreement to expand the single lane stretch of the Esterley Tibbetts Highway from Camana Bay to the Butterfield roundabout in George Town into a duel carriageway. (CNS): The trial of five men charged with armed robbery at the Buckingham Square branch of Cayman National Bank (CNB) in June last year opened Thursday before a jury of 5 men and 7 women. Andre Burton, George Mignott, David Tomassa, Rennie Cole and Ryan Edwards have all denied the crime but a key witness and co-conspirator, who has pleaded guilty and is awaiting sentence, has given evidence against the accused gang of robbers, who are said to have stolen over $500,000 during the daylight hold-up. The crown claims that two of the defendants entered the bank armed with one real gun and one imitation weapon, along with the co-defendant, dressed in construction wear with their faces concealed. The robbers stole from both the tellers and the vault, making off with CI and US cash, some which they managed to drop on the highway during the bungled getaway, when the robbers escape from the bank was blocked by an armored truck. 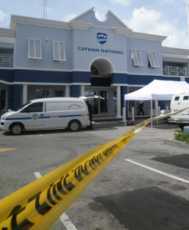 According to the crown’s case, shortly after CNB opened on 28 June, one of the robbers entered the bank and began asking a security guard about identification as a distraction while two other armed men ran in and commanded the customers and staff to lie on the ground. The court heard Thursday how one of the men jumped onto a teller’s counter and told her to hand over the money or he would shoot her. During cross examination the customer service representative said that she kept her head down and did as he said because she thought she was going to die. She recalled how the man moved on to her colleague to collect more cash, while another one of the robbers commanded two other staff members to open the vault and give him the money. Despite getting himself stuck in a partition behind the teller’s station, one of the three robbers was rescued by his accomplice before the perpetrators fled with more than a half million dollars. However, armored truck driver Terry Williams happened to be arriving in the nick of time and was able to block the robbers, who were trying to escape in a white Toyota Windham. As a result, the gang of robbers fled on foot along the Esterley Tibbetts Highway, heading for what the crown said was a second getaway car, driven by another one of the defendants, dropping some of the stolen loot as they ran. The men eventually fled the scene in a Red Chevy Equinox, which was later discovered to belong to the prosecution’s key witness and the robbers’ accomplice. Later that day, police recovered the getaway vehicle with the suspect hiding inside with a bag of money from the robbery. The man admitted the crime and gave statements to the police concerning the role he and his co-conspirators played, along with the planning and execution of the bank heist. Crown counsel said that three of the defendants went to the same residence following the robbery to hide the money and guns. According to the crown’s case, DNA tests on swabs taken from the headrests of the getaway vehicle and a cap found inside will show at least two of the defendants in the dock were in the getaway car. The crown also revealed that ‘bait’ money stolen from the bank during the robbery was found in Jamaica sometime after the incident in a stop and search by local police there. A total of $502,000.17 was stolen from the banks — some $38,000 from the customer service representatives at the teller counters and the rest from the vault. The trial continues in court one this week and is expected to last approximately four weeks, with the fate of the five men resting in the hands of a 12 person jury rather than the usual panel of seven. Although robbery is usually tried by just seven jurors, as a result of the significant amount of evidence that the jurors will be expected to consider and the length of the trial the jury was increased to twelve people.